Traditional German food is rich, tasty, and, most importantly, delicious. You have always wanted to visit Germany. You have always wanted to see the sights and taste the foods. The country is beautiful, the food is rich and delicious, and you have finally booked your dream vacation with AESU. Now for the hard part – WAITING. While you count the days until your trip, perhaps you can spend this time educating yourself on German culture. More specifically, perhaps you can spend this time educating yourself on traditional German cuisine. After all, you will want a game plan on your trip. Which foods are you dying to try? Traditional German food is rich, tasty, and, most importantly, delicious. Germany’s rich food is influenced by its rich history. For hundreds of years, the German Empire consisted of hundreds of small kingdoms, free cities, duchies, etc. And while Germany is very united today, each region remains proud of its heritage, traditions, and customs, which include food. For instance, Weisswurst is a popular dish originating in Bavarian, Currywurst was invented in Berlin, Black Forest Cake comes from Baden-Württemberg, Rheinischer Sauerbraten originated in North Rhine-Westphalia and Rhineland-Palatinate, Königsberger Klopse was made famous in Germany’s northern states, and so forth. And almost every region has their own special kind of wurst (sausage). A Meal Fit for an Emporer, a King, and a Beggar? Frühstück (Breakfast): A full breakfast includes bread rolls, toast, sausages and cold cuts, cheese, boiled and fried eggs, muesli and cereals. Mittagessen (Lunch): Germans typically have their fully cooked meal for lunch between noon and 2pm. A traditional German lunch consists of a light soup, meat, vegetables and potatoes or rice as main course, and a delicious dessert. Kaffee: Similar to British tea time, Kaffee is a break between lunch and dinner often involving a cup of coffee and a piece of cake, or cookies. Abendessen (Dinner): A traditional German dinner consists of bread, cold cuts, cheese, salads, pickled vegetables, and fish. However, nowadays many of these traditions are put on hold during the week when there is simply no time to eat a big breakfast before work or a hot lunch in the middle of the day. The weekends are quite a different story. Apfelstrudel: Better known as apple strudel, this traditional German food- popular since the 18th century – is a delicious pastry filled with apples flavored with sugar, cinnamon, raisins and breadcrumbs. Eintopf: Meaning “one pot,” Eintopf is a soup containing broth, vegetables, potatoes or pulses, and meat (pork, beef, or chicken) or fish. Recipes can vary from region to region. Kartoffelpuffer: These shallow pan-fried pancakes are made using grated or ground potatoes mixed with flour, egg, onion and various seasoning. Sauerbraten: Meaning “sour” or “pickled” roast, Sauerbraten is a pot roast marinated in wine, vinegar, spices, herbs and seasoning for up to 10 days. Schnitzel: This thin, boneless cutlet of meat is coated in breadcrumbs and often served with a slice of lemon. Schwarzwalder Kirschtorte: This Black Forest cake is named after schwarzwalder kirschwasser, a liqueur distilled from tart cherries. 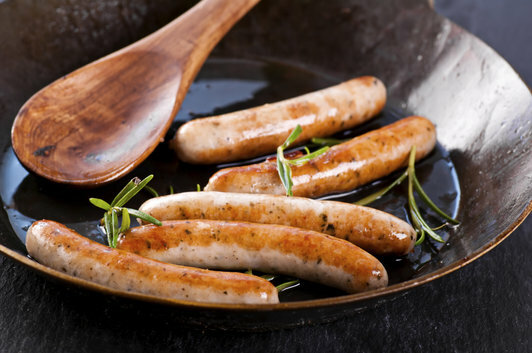 Wurst: This traditional German sausage comes in many variations depending on the region you are visiting. In fact, there are more than 1500 different types of wurst made throughout the country. Affordable Trips to Germany – Taste the Tradition! AESU, the most trusted name in travel, offers unique, exciting travel programs for college students and young professionals at affordable rates. Each trip is action-packed and informal—designed just for people your own age. We are also able to design custom tours just for your group. AESU offers several trips to Germany: Euro Focus, Great Escape, and Euro Spree. Want help booking your trip to beautiful – and delicious – Germany? Please contact AESU by calling 800-638-7640 or fill out the contact form found on our website. And don’t forget to check out all of our great Travel Tips, especially the Travel Tips for Europe, before you head overseas. This entry was posted on Thursday, May 21st, 2015	at 3:09 pm	. You can follow any responses to this entry through the RSS 2.0	feed. Both comments and pings are currently closed.